to give you the most sustainable, economical and efficient hand dryer in the world. 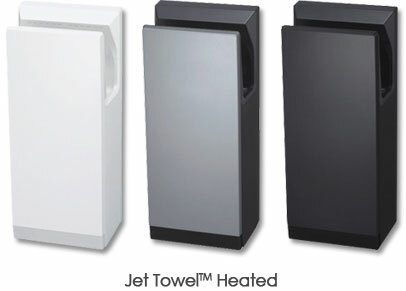 Two versions of the Jet Towel™ hand dryer are available; the heated unit and the unheated unit. The unheated is available in white, whereas the heated is available in white, black and silver, allowing for the Jet Towel™ to fit easily into a wide range of decor. * Drying times (remaining moisture of one hand being 50mg or less) obtained using in-house measurement method. * Airflow rate measured at the nozzle outlet. * Noise measurements performed in an anechoic chamber at a distance of 2m. * Red letters indicate field wiring related dimensions. * For fastening main unit mounting screws, use a Philips (+) screwdriver with a shaft length of at least 150mm. Allow 200mm or more to enable the water drainage duct to be checked after cleaning. 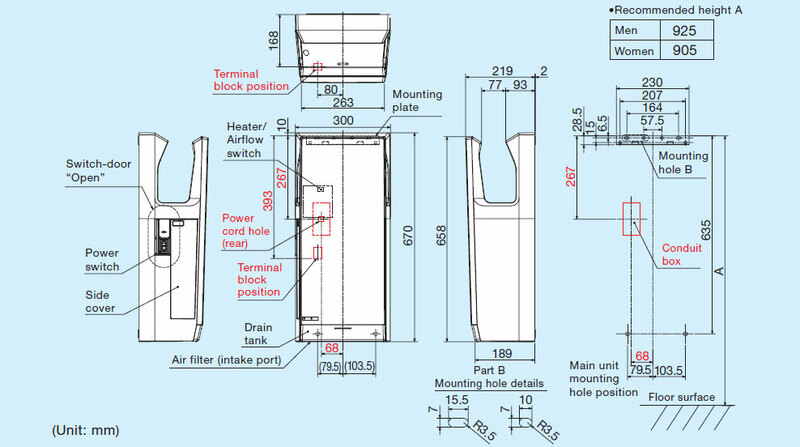 * Allow at least 130mm between the bottom surface (air intake port) of the unit and the floor surface. Follow the Jet Towel™ from the beginning through 20 years of exceptional engineering ingenuity to the continual pursuit of perfection. More. 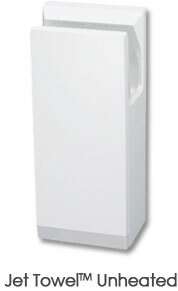 With unparalleled energy consumption at just 550W the Jet Towel™ is the most energy efficient hand dryer! Just one of the many reasons why Jet Towel™ technology is better. More.